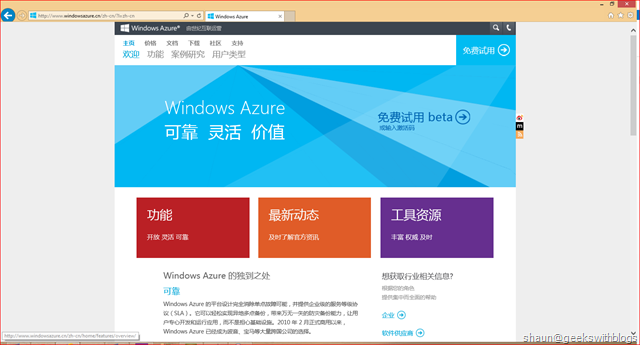 On 2nd May, 2013 Microsoft announced that the Windows Azure had been landed at China by Steven Ballmer. Currently there are two Windows Azure data centers in China, Beijing and Shanghai, which geo-replication each other. The code name of Windows Azure in China was “Mooncake”, which is a famous food in Chinese Mid-Autumn Festival. 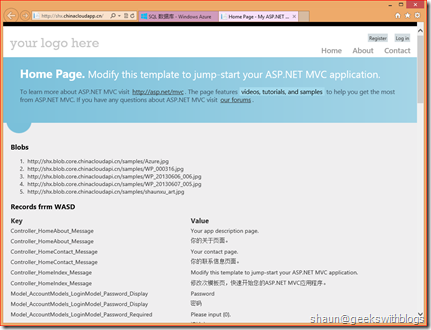 Hence in the coming up posts when I said Mooncake, or MC, or MC Azure, normally it means the Windows Azure China. It was also announced that from 6th June, the public beta registration will be opened and till now within 24 hours it had received thousands of requests. In the coming few weeks Microsoft will evaluate these requests and start to ship the accounts. This means, developers, partners and customers mainly in China (and in worldwide as well) would be able to develop, deploy and test their applications and services on Windows Azure China. 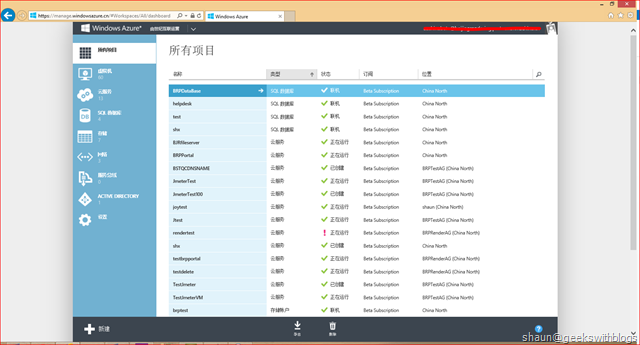 If you are familiar with Windows Azure platform, you will find the services and functionalities are almost same between worldwide Azure and Azure China. But there are something different when developing application against MC rather than worldwide Azure (a.k.a. WW Azure). Most of them are endpoints of vary azure services such as Cloud Service DNS name, SQL Database endpoint, Storage endpoints and Management API endpoint, etc.. In this post I’d like talk about these different so that we can develop and migrate application on MC Azure more smoothly. This post will only focus on the different points between worldwide Azure and MC Azure. 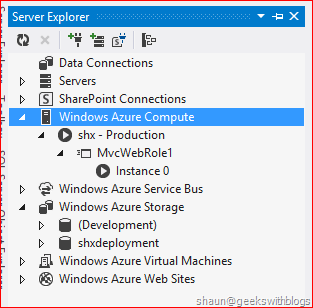 If you are new to windows azure platform, I highly recommended you to have a look on the documents on MC Azure and worldwide Azure here and here, before deeply read this post as I will NOT describe the functions/features in Azure. The first different point is the Windows Azure Portal. 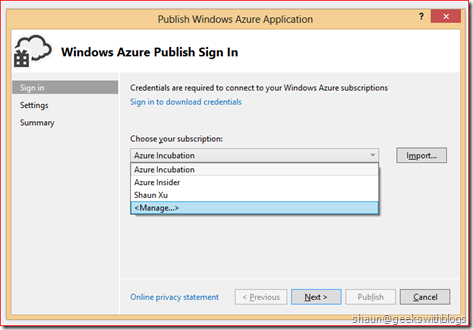 The WW Azure portal is http://www.windowsazure.com/ regardless which data center it’s. 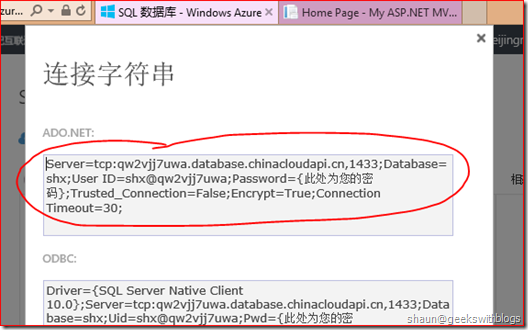 But the portal of MC is http://www.windowsazure.cn/, and it only for Windows Azure China. 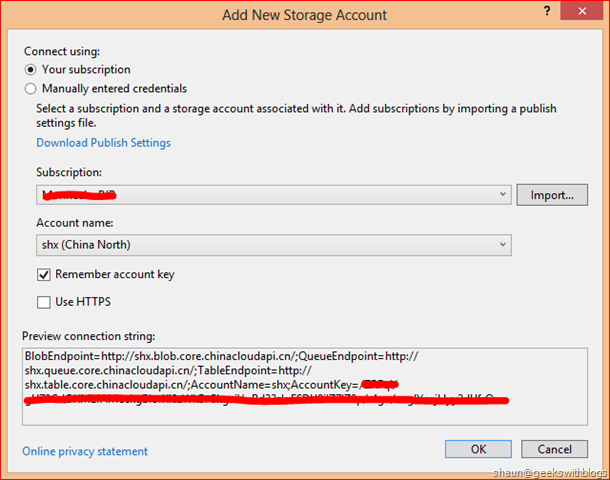 Since the portal is deferent, the develop portal is changed to https://manage.windowsazure.cn/ as well, where we can login and manage our azure services. Once logged in, we will find that currently there are seven services provided in MC Azure, which are Virtual Machine, Cloud Service, SQL Database, Storage, Virtual Network, Service Bus and Active Directory. 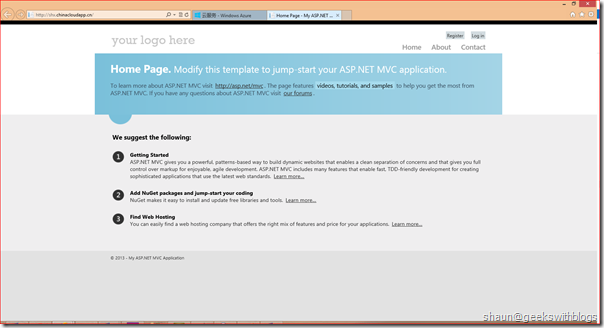 Other services will be available before the MC Azure was GA, such as Media Service, Mobile Service, HDInsight, SQL Reporting, etc..
Now let’s create a new Cloud Service with one ASP.NET MVC 4 Web Role and deploy to MC. 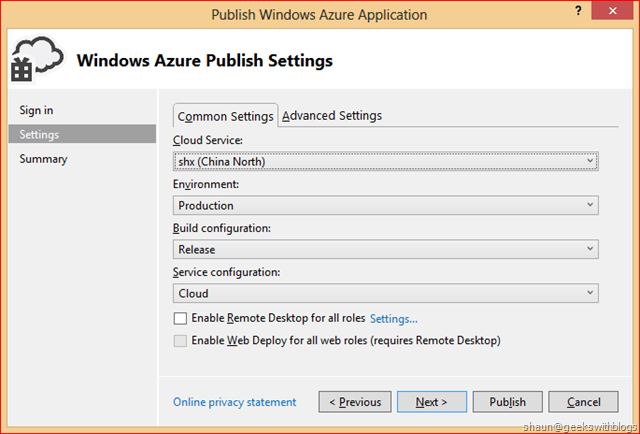 First of all we need to create the project in Visual Studio 2012 with Windows Azure SDK 2.0. 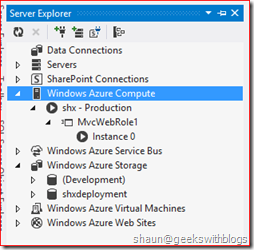 As you know, we can deploy our project to azure by uploading the package, but in this post I’d like to demonstrate how to deploy it in MC Azure through Visual Studio. 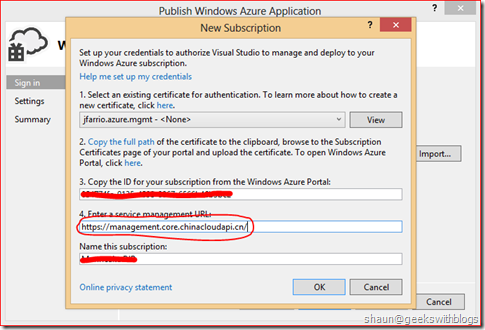 Since we want to deploy the project from Visual Studio, we need to upload a new certificate to the portal for management. This is same as what we did for WW Azure. Clicked “SETTING” from the left hand side navigate bar and upload our management certificate. Then back to Visual Studio, click the Deploy context menu item and here we need to add a new subscription for our MC account. Click “Manage”. 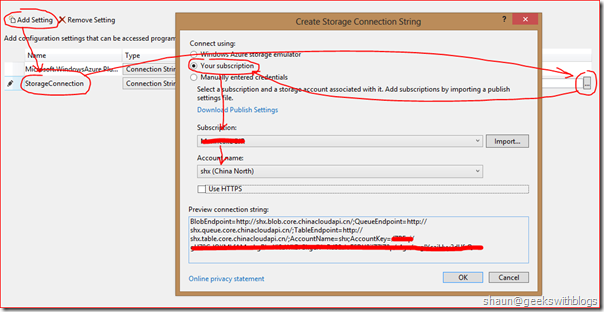 Create a new subscription and select the certificate I had uploaded through the management portal, paste the subscription ID and the name in the dialog. Then we need to change the service management URL, since it’s different between WW Azure and MC Azure. 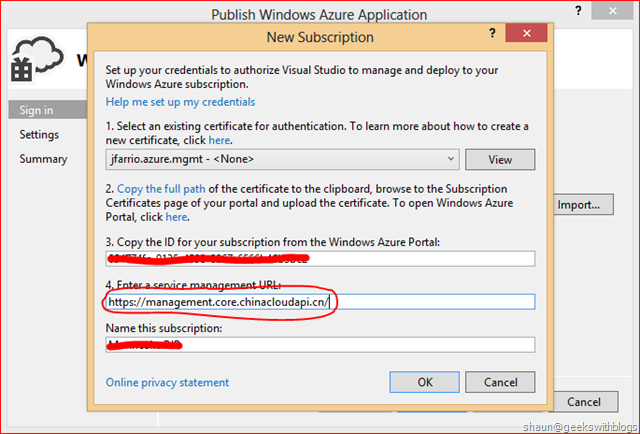 If you are working on MC Azure, the URL of Windows Azure Management API should be https://management.core.chinacloudapi.cn. Then we can select the Cloud Services we wanted to deploy in this subscription, the environment (Production or Staging), build configuration, service configuration (Cloud or Local) and the storage we will upload our package to and then press Publish. If the management URL we specified was correct we can see Visual Studio started to upload our project to MC Azure and it should be ready after few minutes. Below is the MC portal after I deployed my project. As you can see it’s same as what we saw at WW Azure. 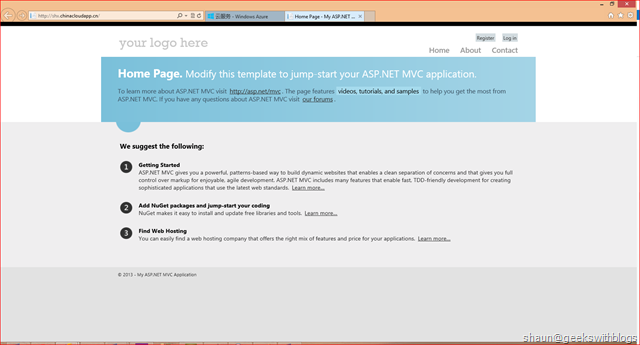 Below is my first cloud service running on MC Azure. The public URL was http://shx.chinacloudapp.cn/. 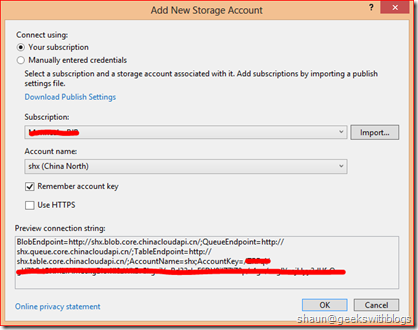 This is another different point in MC Azure, the cloud service DNS name is *.chinacloudapp.cn, while in WW Azure is *.cloudapp.com. Once it had been deployed we can review the status of this service through Visual Studio. Open the Server Explorer window and expand the Windows Azure Compute we can see our cloud service had been listed there with one instance running under the production environment. 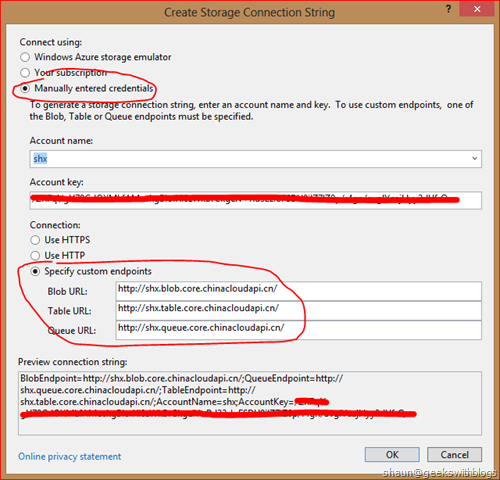 Since we had created a new subscription information in Visual Studio in previous step, we can now easily manage our storage account through Visual Studio as well. Open the Server Explorer and add a new storage account. 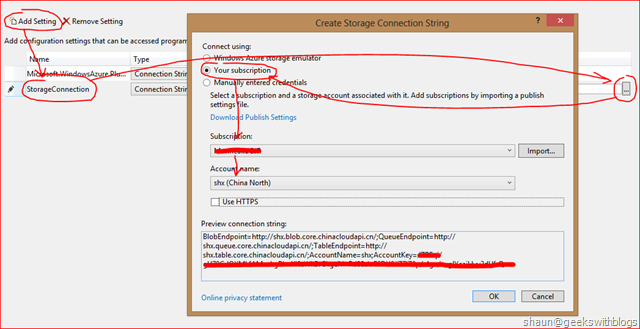 In the popup windows we will select the subscription we had just added, then Visual Studio will populate all storage account under this subscription. Once we select the account we want to manage the endpoints will be shown automatically at the bottom of this windows. 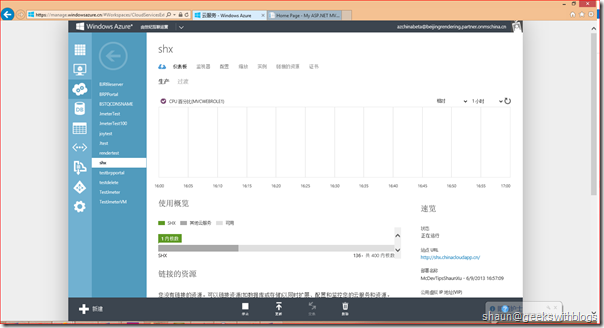 As you can see, the storage endpoints were *.blob.core.chinacloudapi.cn, *.queue.core.chinacloudapi.cn, *.table.core.chinacloudapi.cn, while in WW Azure the storage endpoints are *.blob.core.windows.net, *.queue.core.windows.net, *.table.core.windows.net. If we added this account in Visual Studio Server Explorer we would be able to manage it in the same way as what we did for WW Azure. The screenshot below shows when I created a blob container and uploaded some pictures into my storage account located in MC Azure Beijing. Next, let’s add some code to use the storage service I created. 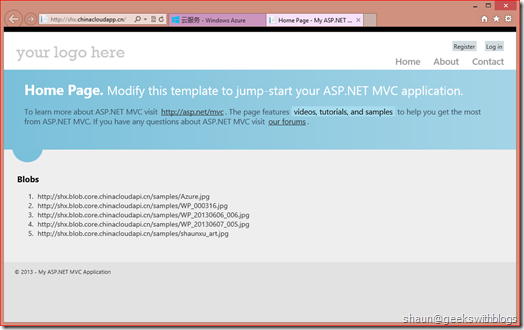 For example, I will add some codes in my ASP.NET MVC website to list all blobs in my container. This is not a huge work but will show you what needs to be changed when using MC Azure. 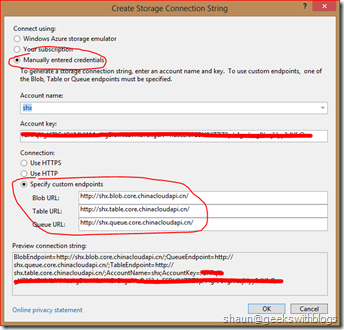 First I need to specify the storage account connection string in the cloud service setting window. As we had added our MC Azure subscription we can select the storage account we want by selecting the subscription and storage name. Alternatively you can specify the storage endpoints manually. Just need to pay attention that we must select “custom endpoints” and specify the blob, table and queue endpoints for MC Azure. That’s all. 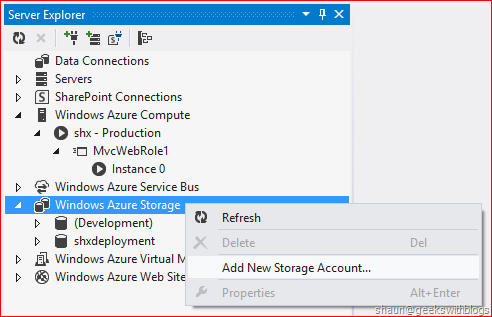 Now we can use the Azure SDK to operate our storage service same as what we did against WW Azure. Below the code I created to retrieve all blobs from my container. And this is the website once I deployed to MC Azure which lists the blobs in my storage account in the same datacenter (Beijing). 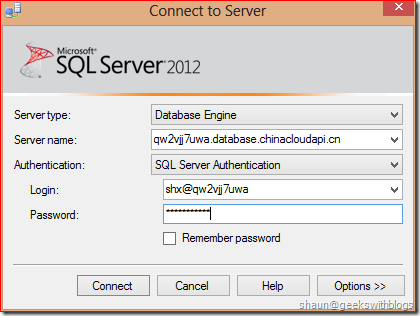 Windows Azure SQL Database (a.k.a. WASD) is another resource we always use when building application. The WASD in MC Azure has a different base address, *.database.chinacloudapi.cn, the WW Azure WASD base address is *.database.windows.net. But the connection string format and login format are all the same. For example, if I created a new WASD and updated its firewall setting then I can connect to this database located in MC Azure through any SQL Server management tools. Below is the WASD connection string I created in MC. The format is same but only different base address. 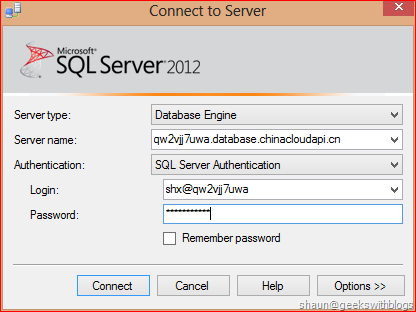 We can use SQL Server Management Studio (SSMS) to manage our WASD from local machine, same as what we did for WW Azure. Let’s execute the script below to create a new table with some data into this database. 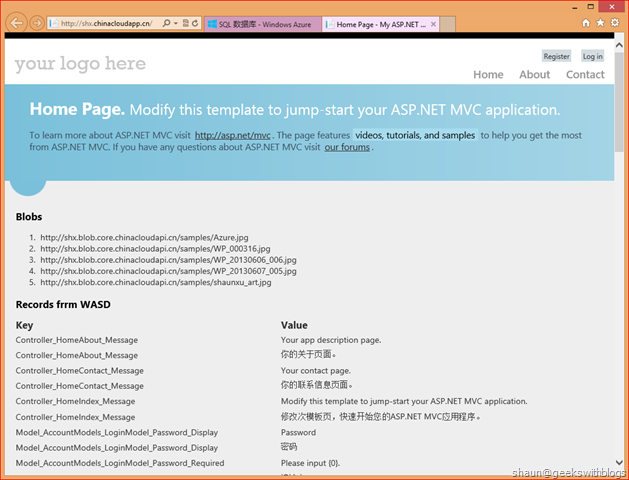 Then back to Visual Studio to add some codes to retrieve data from our WASD on MC Azure. First of all we need to specify the WASD connection string. 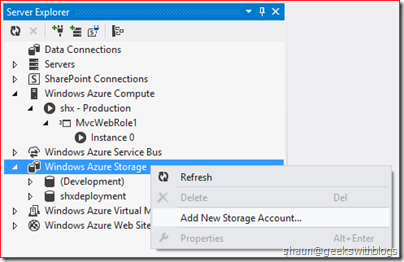 Copy the connection string from MC Azure portal and add into our cloud service configuration through Visual Studio. Next, paste code into HomeController.cs so that it will retrieve all data from our database on the home page. 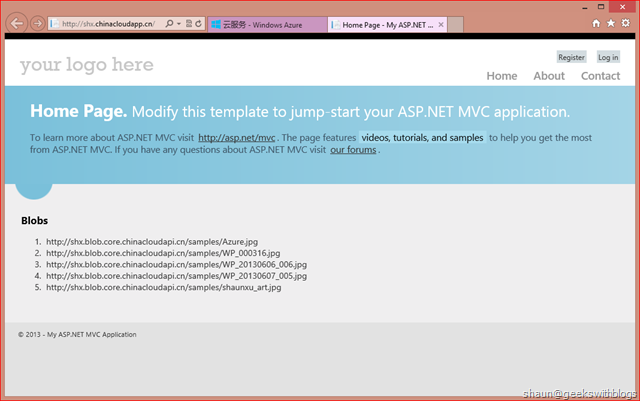 Then publish the application to MC Azure, below is the result of the home page. From the functionality perspective, Windows Azure China (MC Azure) is exactly same as the existing Windows Azure in worldwide (WW Azure). But MC Azure has some different endpoints. When developing against MC, we need to pay attention to the endpoints listed below. Some of them are easy to remember, but some may related with other function. For example, for diagnostic monitor and cache role, it needs to specify a storage account which should use MC storage endpoints. And some 3rd party component such as the Enterprise Library AutoScaling Application Block relies on the Management API, we need to check that the reference endpoint is correct to MC Azure. Some management tools, for example the Windows Azure Storage Explorer, we are willing them to add the functionality to specify the endpoints manually. After all, MC Azure is the first worldwide public cloud computing landed in China and it’s also the first time Microsoft running Windows Azure with different endpoints and with a operating partner. 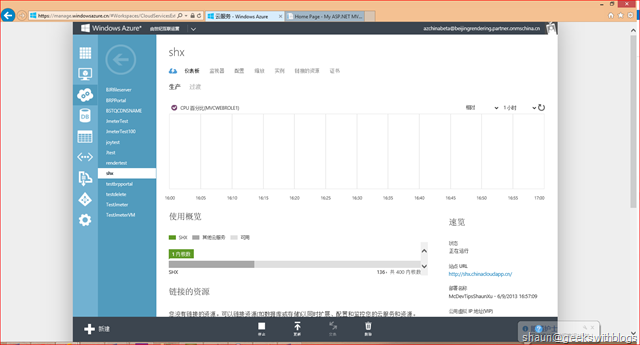 It needs time to make the service getting better and it should be true that when Windows Azure China GA all services running on Worldwide Azure should be available on Windows Azure China, even though with some different endpoints but much better bandwidth and network connectivity to all developers and customers in China.